Spring is in the air, and that means it’s time to start making plans for Easter! What to wear, what to eat, who to spend the holiday with, and when to die Easter eggs?! Easter is such a lovely holiday, isn’t it? Sure, flowers are in full bloom, new life and greenery abound, and goodie-filled baskets are aplenty, but celebrating the Savior of the world rising from death to life is an incredible honor that leaves me in awe year after year (okay, day after day…minute after minute). But, if we’re not careful, Easter is yet another holiday that can get lost in commercialization and candy along with Halloween and Valentine’s Day. I try to be intentional when celebrating especially meaningful holidays like Christmas and Easter. It’s important that my kids know the incredible significance these days hold. Several years ago I found these Resurrection Eggs and they quickly became an Easter tradition in our home. It can be hard for young kids to grasp the idea of a Biblical truth that still brings life today, so giving them something to see, hear, feel, and touch is essential. We faithfully use these Resurrection Eggs as an Easter tradition in our home. The Resurrection Eggs set comes with a dozen eggs filled with trinkets that help tell the story of Jesus’ arrest, crucifixion, and resurrection. Accompanying the eggs is a booklet that correlates each portion of the story to an egg. As you read the story, the children open an egg to find a meaningful symbol to help them understand and relate to it. You can either do them all at once or spread them out over the days leading up to Easter. Our family does them all in one sitting. The Resurrection Eggs appeal to kids of all ages. My boys are 12, 8, and 3, and we’ve been using them for years. They take turns opening the eggs after their dad or I have read the page of the story. We give them time to talk or ask questions as each child holds the item, and then we move on to the next part of the story. Spoiler alert: the final egg is empty, just like the tomb! 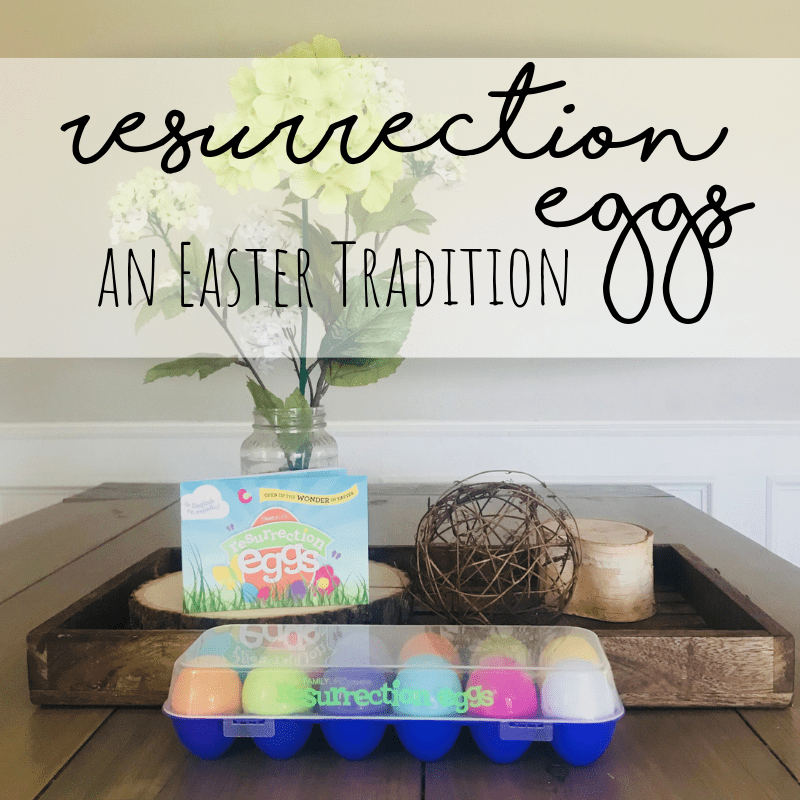 This certainly isn’t the only time we talk about the Easter story with our kids, but it is a fun, hands-on Easter tradition that makes the Easter story come alive for our children year after year. I'm Crissy Cates, a grace-needing, Jesus-loving woman, wife, and mom to three rambunctious and sweet-spirited boys. My goal is to live life ON PURPOSE. I cherish the written word and the power it has to transform lives. Join us for weekly challenges and encouragement!